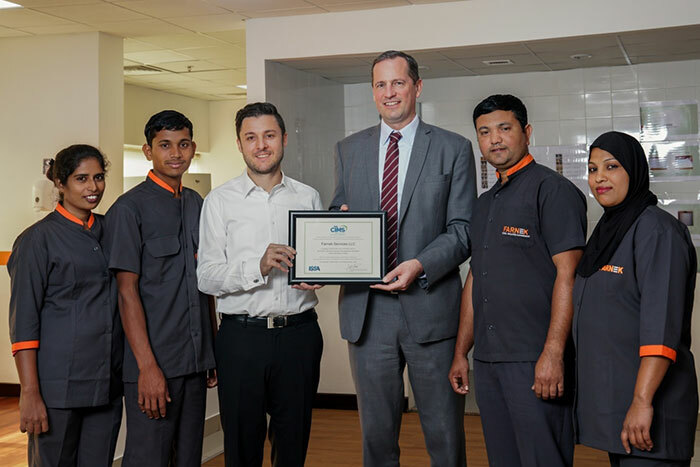 Leading UAE-based technology and sustainability-driven facilities management (FM) company Farnek has successfully achieved ISSA Cleaning Industry Management Standard Green Building (CIMS-GB) certification, with honours, which is awarded for a two-year term. The world’s leading trade association for the cleaning industry, ISSA’s CIMS-GB is a comprehensive programme that raises the level of commitment for the delivery of environmentally-friendly services. Farnek had to demonstrate its compliance with the six core principles of the standard: quality systems; service delivery; human resources; health, safety, and environmental stewardship; and management commitment. Cleaners Sabeetha Pushpakumari Thennakoon Arachchilage and Subash Mengondad, Julian Khalil (director of soft FM), Markus Oberlin (CEO), cleaners Patwali Mustafa and Hajarah Begum. Commenting on the award, Markus Oberlin, CEO, Farnek, said: “Having undergone a comprehensive assessment of our operation to deliver green cleaning services, Farnek is now the first company in the UAE to be certified by ISSA, inline with the CIMS-GB standard. The standard is also tailored to provide Farnek’s customers with precisely what they need to secure points under the Leadership in Energy and Environmental Design (LEED) for Existing Buildings; Operations and Maintenance (LEED EB: O&M) Green Building Rating System. “LEED aims to encourage and support building owners and operators to become more environmentally responsible and use resources efficiently. As such, CIMS-GB certification demonstrates our capability to assist our clients to help achieve LEED EB: O&M points, offer them partnership assurance or simply support as a CIMS-GB certified cleaning service provider,” added Oberlin. To comply, Farnek has also met various criteria with the focus on sustainable cleaning practices. This included implementation of a green cleaning policy, resource conservation plans, environmental impact analysis of its operating procedures and enhanced staff training programmes for green cleaning. The certification also makes it easier for Farnek’s potential customers, to find a contractor that understands the value of sustainability and one prepared to deliver professional services. In addition, Farnek will also be able to reduce costs and pass those savings on to its customers, while also ensuring a sustainable business model. “We assessed over 100 of our cleaning standard operating procedures (SOPs) and included an environmental impact analysis to conserve resources during the cleaning process. We can now teach our staff to choose cleaning techniques that have less impact on the environment by using less water and electricity, while producing less waste. Management can decide on products and policies for a particular contract and cleaning operatives can choose which technique to use to execute the job most efficiently,” added Khalil.